Education Dive is a great, free resource and daily digest summarizing a variety of articles daily. 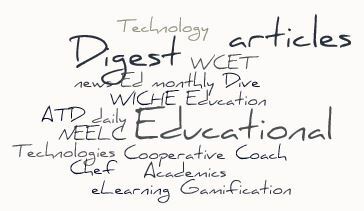 “The Education Industry in 60 seconds” they say… I like their daily email – it gives me a quick overview of a variety of news articles and related items, with links to those items for a closer read. Great resource for those in the education field. Ed Digest is similar, but it’s not free, and does focus more more academic articles and research, as opposed to general news and articles per Education Dive. However, their summary page of monthly articles provides links to the external sites and resources they discuss, which makes for a good ‘pull’ resource. Connie Malamed’s “eLearning Coach” is frequently updated with a variety of helpful and insightful articles. 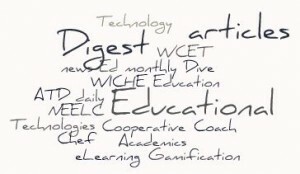 Ray Schroeder’s “Educational Technology” blog is not only updated daily, but often multiple times a day. I’m not sure if he just has a lot of contributors or he’s largely scraping ed-tech related articles from elsewhere, but it’s a good resource to bookmark. Karl Kapp knows his eLearning eStuff, and any questions about Gamification, he’s got answers, or at least an opinion. His site is a bit self-promotional but does have a solid set of resources available for anyone exploring the world of eLearning. Then there are larger organizations like ASTD ATD, eLearningGuild, etc. that we all know about. But how many have heard of the “Western Interstate Commission for Higher Education” (WICHE)? I never had til I started working with DeVry (based in Chicago). I wish they had something like that here on the East Coast. Anyone know of any such seaboard group? Only somewhat similar group I know of is the “Northeast E-Learning Consortium Conference” (NEELC). I attended the 2014 meeting at Villanova and, while small, it was great…but like to conference, the group is small and without a decent web-presence at all…(I missed their March conference at Temple as they don’t even seem to have any sort of announce list). Anyway, a significant part of WICHE is the (WICHE Cooperative for Educational Technologies) which is the ‘proactive’ component in integration, research, and presentations…and they still have a listserve (I know, oldschool, but I like it). A look at their ‘members page‘ shows pretty much every educational institution in the midwest, and beyond. I plan to dig into that group more, as time permits. There are, of course, also several links to the right of these blog pages as well for a range of other similar resources. I hope you find any or all of these helpful! Great resources, especially Connie Malamed’s blog – love it! The articles are always not only interesting but also very helpful. When it comes to listing resources, you’re right there’s so many of them and hard to mention each one though I would add http://elearningindustry.com and elearningtags.com – both are mixes of valuable stuff. Open to all such resources!